Professional Dancer (About to join the cast of Anything Goes UK Tour). Currently residing in the UK. The very first time I worked with Faust was for the production of Oliver! 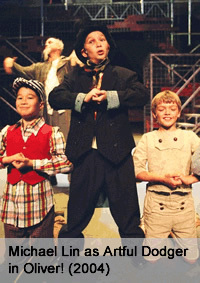 in 2004 as the Artful Dodger. Following this production, I was lucky enough to be cast as Peter Pan in Peter Pan (Hong Kong 2005, Singapore 2006). Throughout this time I also attended drama classes once a week. When I FINALLY learnt how to juggle with three balls and flying in Peter Pan with a flight effects company! Being able to work quickly and efficiently within a random group of people. 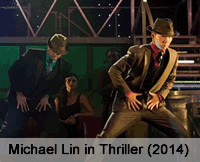 For example, in 10 seconds, we’d have to come up with a tableau or small scene. This was always a challenge as you’d never have the same set of people but you’d have to react quickly to what you have and work as a team. I think my experience at Faust as a student gave me the chance to improve my ability as an actor. The simple task of standing in front of a group of people in itself enables to you to practice your acting under the guidance of enthusiastic teachers. Studying drama and theatre still does play a huge role in my life! All the things I have learnt throughout the years within drama workshops, rehearsals and productions will continue to be utilized whenever I perform or go to work or attend workshops. Little things such as theatre etiquette, or tech week procedures are now almost second nature to me thanks to studying drama and being actively involved in the theatre business. In addition, I think studying drama and theatre raises your general confidence, which not only enhances your on-stage performance, but your ability to communicate with others. Faust is a great programme for kids or teenagers and enables them to explore themselves artistically.